1. I wrote like the wind! I finally finished my fitting chapter (well, the first draft of it anyway) and turned it in to my editor. Sweet relief! Amazingly, the basic text of the book is written (sans revisions, of course). Next, it's on to the projects. Ten patterns—with variations. I can't wait to start sewing the garments for the book. I managed to get my chapter in last Wednesday, which left me plenty of unwinding time before I picked up blogging again. Here's what else I did . . .
2. I painted. 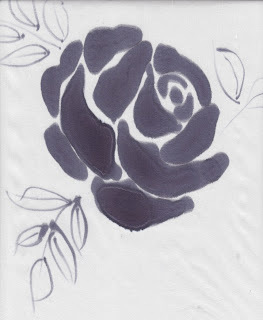 Remember when I wrote about being interested in silk painting to replicate some vintage rose prints? Well, I got some shantung and Dye-Na-Flow paint and sumi brushes and had myself a ball. I started with the roses in a deep blue. Guys, I painted two and a half yards of roses. I can't wait to make a dress out of them. The trick is that you have to stabilize the fabric. I used embroidery hoops since that's what I had handy. I could only do two roses at a time, but I was persistent! I covered up my ironing board with a towel and used that as a surface. 3. I moved on to poppies later. 4. I learned Photoshop. Well, as much as one can in three hours. I invested in a one-on-one lesson to learn the basics of manipulating images. It was fantastic! I learned how to do some awesome stuff with scans of my silk paintings. 5. I came home and started designing fabrics on Spoonflower. Readers, I went crazy. More on this later, after I get swatches of my designs in the mail. 6. I bought a sweater. It's a casual sweater in bubblegum pink. I wore it for three days in a row over the weekend. 7. I started a book. My Life in France by Julia Child, at the recommendation of commenter thatgrrl. I'm loving it. It makes me inexplicably happy that Julia didn't start learning French cooking until she was 36. Also, she adored her husband so much. It's a great love story. Okay, I'm going to quit before I start telling you what I had for breakfast each day. I'll leave it at this: it's good to be back! "6. I bought a sweater. It's a casual sweater in bubblegum pink. I wore it for three days in a row over the weekend." A girl after my own heart! Welcome back! Wow, the painted fabric looks amazing, really beautiful! I tried painting fabric years ago and after seeing this I can't wait to try again. You were quite a busy gal on your week off! The fabric painting has me really excited--it looks so beautiful! Any particular resources/books you'd recommend on the topic? Gah, those poppies are gorgeous! !You've been a busy, busy lady!! All sounds like super fun stuff though. Welcome back! Now that's a creative break with a capital c! You have a talent for painting, the flowers are gorgeous. Can't wait to see what you'll make with them. Welcome back! Sounds like a productive break! Julia Child's autobiography is one of my favorite books of all time! I won a silk painting/dyeing kit in a raffle just before the holidays. I think I'm going to get it out and give it a try. Also, Parks and Rec is great, isn't it? Have you seen Party Down? I was actually sad when I heard Adam Scott was going to be on P&R because it pretty much put the prospect of a 3rd series of Party Down out of the question...couldn't stay sad, though. He's been a great addition to one of my favorite shows. Your painted fabrics look beautiful! I can't wait to see what you make out of them! 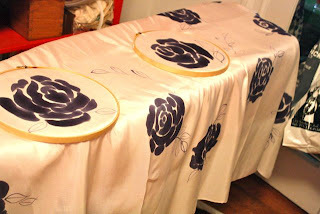 I love the idea of painting your own fabric - I love the poppies. I can't wait for your book to be finished and out! Hopefully it will be available in the UK too! The painted fabrics are fabulous! Welcome back. You should check out Lynda.com... great video tutorials for learning software, like photoshop. Casey, Dharma Trading is a great resource. Check out this beginnger's guideto materials. That was all I needed to get started! Just click through the steps. Tracytracy, I LOVED Party Down. I'm right with you--I was so bummed when it was cancelled, but getting hooked on Parks and Rec is a good consolation prize. Wonderful Gertie, and the dress is wonderful as well. I have started to translate and make available a sewing book from 1953 with 48 pattern sheets. I hope to publish one pattern sheet and accompanying sewing instructions a week. yay for spoonflower! I just love that site! I an envious of your painted fabrics, gorgeous, and I can't wait to see what you've created on Spoonflower, not to mention what you create with the fabric. Holy run-on sentences! Your roses and poppies are WONDERFUL!!! I LOVE Joel McHale and I love Community! Did you know that Gogurt is JUST yogurt? Beautiful painting! And I'm so glad you like the book- I just turned 36 and am rather flounder-y right now as to where my life will go, and knowing the Julia's life changed in such great and unexpected ways starting at this age is indeed happy-making and comforting. love the printed fabric!! it's given me the urge to do my own lol! 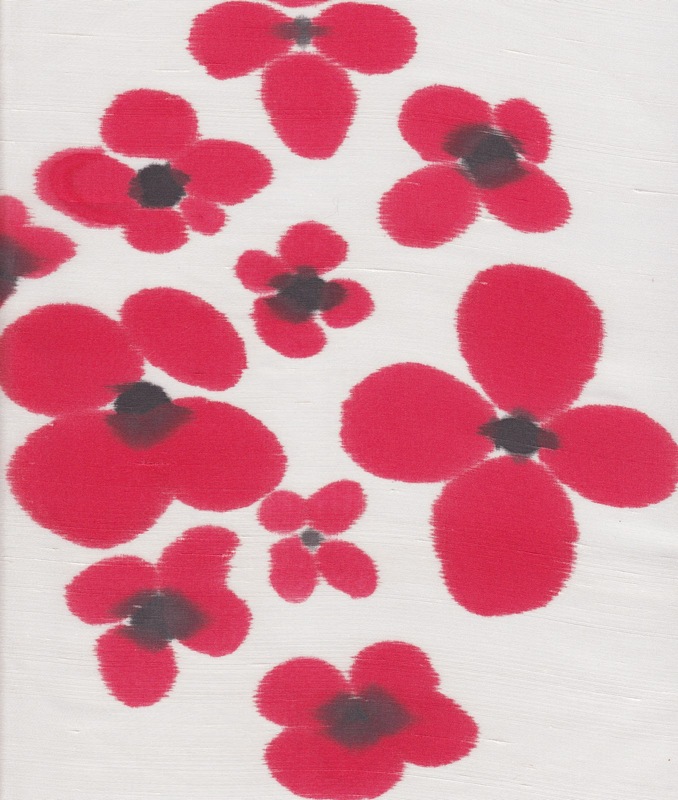 The poppy print is fantastic! I can't wait to see what you make. beautiful painting job! glad you were very productive! It's good to have you back again! The painted fabric looks really beautiful. Welcome back Gertie! I am contsantly amazed at how much you can achieve. You're a real powerhouse of activity - very inspiring! Ooooh, so after the book, can we please have a fabric line by Gertie? Good to have you back! Sounds like a great week! Your flowers look amazing!! Love the painted fabric, was it easy to do? I remember we did something similar in high school but painted outlines in guta (sp??) first so that the ink stayed within the lines. If you're going so far as to paint the fabric, I'm guessing your next vacation will be all about the weaving, and the one after that you'll be sowing and harvesting cotton or breeding silkworms?? I positively loved My Life in France. It is so reassuring to know that one can be right at the outset of such an amazing career in their late thirties. I couldn't put that book down. It is a great inspiration to me, and your commitment to sewing well and thoroughly is also inspiring. Thanks for sharing as much as you do. Illustrator would be a great program for you in combo with a wacom tablet. A wacom tablet uses a digital pressure sensitive pen, so you could paint your flowers and instantly have them digitally. Illustrator has the ability to take that artwork and create a repeat pattern. Looking forward to reading your book. That sounds like the best vacation EVER! And, I found your blog because my grandmother and mother were both named Gertrude. To top that, my grandmother had diners, and I have her name pin (says Gertrude of course) she wore on her waitress uniform! I love community too! last night though I fell asleep before parks and rec. beautiful painted flowers. you must be one of the most motivated people ever. What a great break! I just have to chime in that I adored "My Life in France" and was so inspired by her writing process. I had no idea how much devotion had gone into the creation of "Mastering the Art of French Cooking"! I was so grateful for her dedication and expertise that I went straight out and bought the cookbook. So yummy!